Cycling 100 miles isn’t comfortable. Your legs hurt and your feet are welded into your pedals. Rain doesn’t make the experience any more enjoyable. But it’s a lot more comfortable than the physical and emotional havoc cancer wreaks on its victims and their family and friends. 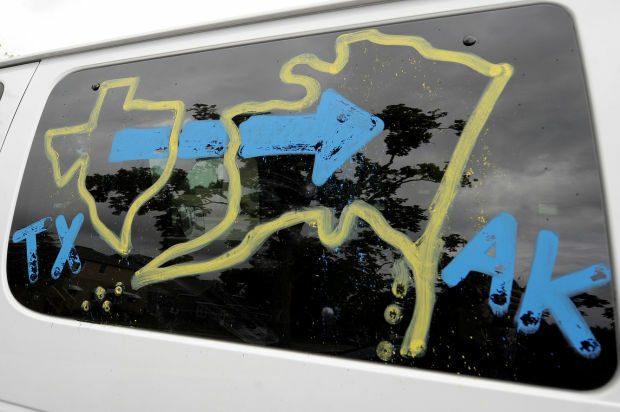 So 21 students from the Univeristy of Texas cover the century distance (or close to it) each day on their way to Alaska, knowing that they’re dispersing hundreds of thousands of dollars to fight the disease in their wake. The troop rolled into La Crosse on Saturday afternoon, their rain jackets a colorful parade crossing the Cameron Street Bridge, and toured Gundersen Health System-La Crosse. “We’re a cancer fighting organization that just so happens to ride our bikes to Alaska,” rider Isaac Benavidez said. That group, the Texas 4,000, has organized two routes from Texas to the northernmost state for the past 10 years. For its one-decade anniversary, it added a third route that meanders through the Midwest. 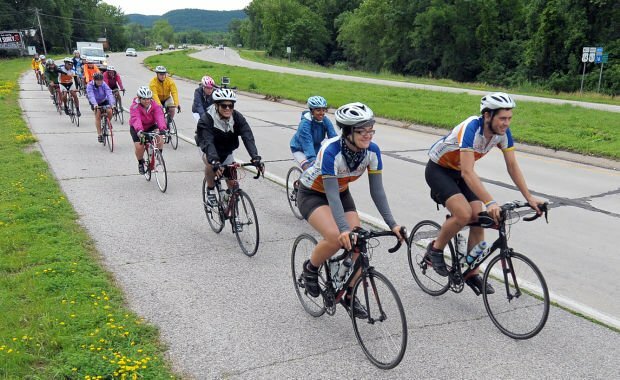 The routes are billed as “the longest charity ride in the world” and span more than 4,500 miles. The cyclists were on the 29th day of a 70-day journey. So far they’ve raised $450,000. Not everyone was a cycling junkie. Many students had no experience with road cycling before the trip, but Texas 4,000 offers an 18-month training schedule to prepare for the ride. Will Vanderbilt’s interest was piqued when he saw a flyer in a bike shop. The route is indeed big — the longest of the three paths to Alaska. “We wanted to touch more communities that were in the Midwest,” Samantha Archer said. They meandered east through gulf states before turning north, finally getting turned west after passing through Chicago. “Now we’re actually facing in the right direction,” she said. A new route has also come with challenges. But the organization has other logistics well-tuned. Two vans and a trailer provide a support team for the riders, and lodgings are planned with host families, churches or community groups. Most of the riders have a personal reason for making the trip. “We’ve all been affected by cancer in some way, shape or form,” Benavidez said. Several Gundersen employees thanked riders for their efforts. Today the group strikes out for Rochester and will wind through Minnesota before entering Canada. They’re scheduled to reach Anchorage on Aug. 8. The money raised will leave a path of influence even wider than the route covered on two wheels.